Most of us view home as our sanctuary – our safe place. On Maslow’s Hierarchy of Needs, shelter falls into the basic needs we all require as human beings, but for some post-9/11 Veterans and those participating in the post-war reconstruction, returning home can be a challenge. Especially those that sustained physical injury, their lives forever altered by an IED (improvised explosive device) or other weapon of conflict. Home may not be the same place it was before. Wheelchairs do not fit through doorways. Countertops, cooking surfaces, sinks and appliances are too high. Stairs and carpets impede mobility. Home represents obstacles, not security. Homes For Our Troops (HFOT) was established in 2004 to help severely injured post-9/11 Veterans by building and donating specially adapted custom homes to help them rebuild their lives. Through the support and donations from companies, like CertainTeed, over 270 homes (and counting) have been built across America for these Veterans and their families. On average, HFOT is constructing between 20 to 30 home per year. The open floor plan (all on one level) and wide doorways provide easy wheelchair access. The countertops and appliances are lowered. The baths and showers completely redesigned. These homes are constructed to provide the maximum comfort. Care is taken to include added insulation in the walls and radiant heating in the floors. This is to help keep the home as warm as possible since many Veterans come home with added metal in their bodies (screws, plates, wires). The unique thing about HFOT is that they are not just building specially adapted custom homes they truly are rebuilding lives. Their program includes all the stakeholders: the recipient’s extended family, networks of Veterans, the community (neighbors, services, etc.) in which they are building their home. They also include the partner businesses who are contributing products and services as well as a support network at HFOT that stays with the Veteran for as long as they are in the home. This kind of ‘safety net’ ensures that the family never feels alone – the journey is well mapped. They even include events throughout the build to help engage all these stakeholders. 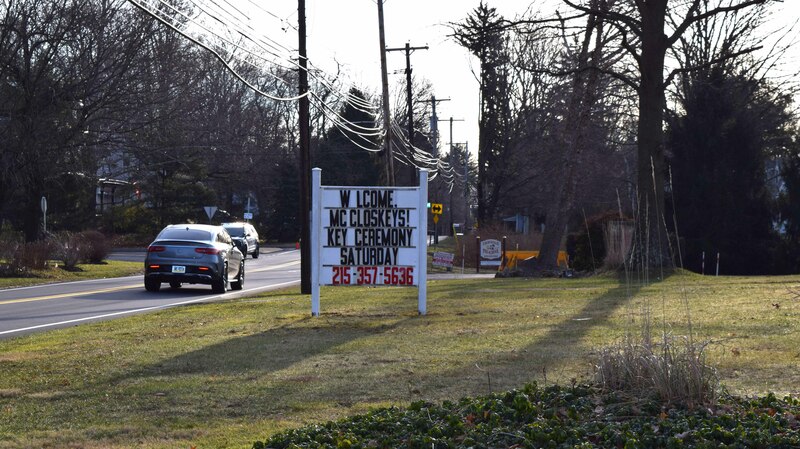 First is the Community Kickoff or groundbreaking for the home. Then a Volunteer Day so all those who want can directly contribute to the build. Friends, family and neighbors help put final touches on the exterior planting and mulching. Culminating in the Key Ceremony, when HFOT and all those involved officially welcome the family to their new home complete with a flag raising ceremony. There is nothing more moving than to hear a Soldier’s story. Our service men and women volunteer for duty and are sent far from home to protect and defend our freedom. A percentage of them will return less than whole. I know for myself, it is something so distant from my daily life that it seems hard to comprehend. But hearing their stories and understanding how in a blink of an eye their lives were changed forever puts things in perspective. I won’t elaborate here because it is not my story. I can’t do justice to it. You can read their stories on the HFOT website to understand. 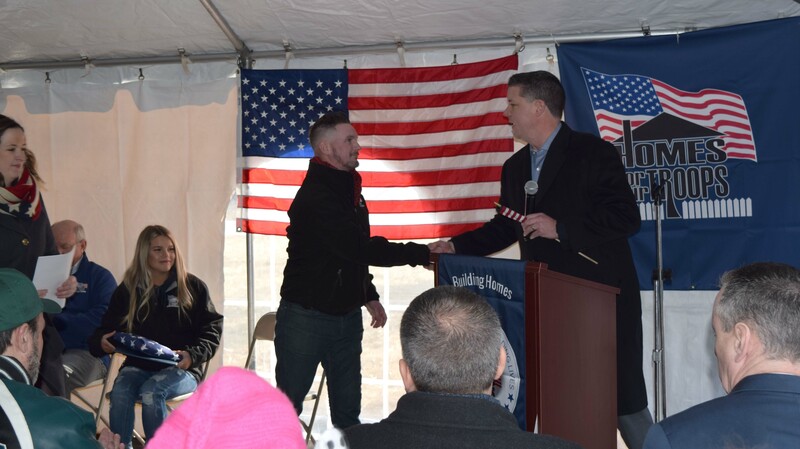 I recently attended a Key Ceremony in the Philadelphia area for a home recipient that CertainTeed has been following since the beginning of his journey with HFOT. It was a very cold Saturday morning in January, but no one cared. We were all there to welcome this Soldier and his wife home. Neighbors, local politicians, business owners, family, huddled in a tent. I grew up during a time when we did not thank our servicemen and women for their service. We did not welcome them back from a horrific war as heroes. We did not want to hear their stories or help them adjust to life after military service. While we can’t undo that damage, I am always moved to tears that HFOT acknowledges any Vietnam Veterans present during these events and thanks them. It is always a standing ovation moment which means that I am not the only one carrying that burden. The unfortunate thing is that there are limitations to the number of homes the organization can provide and many more deserving Veterans who are waiting. If you are looking for a highly rated non-profit organization to support, consider HFOT. If you want to see them in action, find a build in your area and go to an event. It will change your life. Learn more about the many ways CertainTeed is giving back. Plus, more Home For Our Troops success stories and caring for the fence and grounds at Arlington National Cemetery.